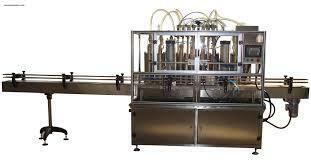 Our era long knowledge in the packing, sealing, filling and labeling machines. List of our products are Automatic Foam, Fill and Seal Machine, Bottle rising Filling Machine, Soda Filling and Screw Capping Machine, Carbonation (Co2) Machine, Automatic Bottle Filling Machines, Foil Sealing Machine, Bottle Washing Machine, Tube Filling Machines, Liquid Filling Machines and Water Pouch Packing Machines. These machines are factory-made based on advanced technology. These machines guarantee the clients of ultra modern procedures and methods that subsequently help them to upgrade their production values. Tough, highly efficient and upkeep free, these machines are accomplished of working for longer hours deprived of any hassles. We have set a vigorous infrastructure, which is extent across a huge area. This flair is reinforced by a group of enthusiastic professionals, which helps us in evolving advanced packing and filling machinery.